Wilson and Edis play Monk. Eagerly anticipated. This Saturday evening the Jazz Café drew Mionk disciples, Caff habitués and the regular slew of city centre circuit drinkers. Thelonious Monk would have liked the Caff’s piano – he surely played worse pianos, much worse. 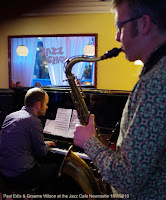 Graeme Wilson’s flying visit to the north east (he had played the Opus 4 Jazz Club in Darlington the previous evening) heard him on tenor in the company of a long-time musical friend, pianist Paul Edis. The front row crowd attentive, others – the cloth-eared – less so, heard two sets of the finest jazz one could wish to hear. Bright Mississippi, with the chord changes to Sweet Georgia Brown right there, opened the programme. It couldn’t get any better, could it? Crepuscule with Nellie – it just got better and better! Graeme Wilson always plays the perfectly conceived solo, whatever the tune, the construction logical, fully formed. The duo format can be something of a high-wire act, the musicians exposed to the dangers less evident in larger ensembles. Every nuanced note heard, Wilson and Edis have an empathetic, if not telepathic, understanding. Edis’ piano playing continues to astonish – Monk with baroque right hand and stride left. Complex, brain-befuddling, the trick, if there is one, must be in the compartmentalising (in the brain) of two disparate musical ideas. A ballad – Light Blue – should have been heard in reverential silence. No chance. The punters were in talkative mood. At one point during the evening Jazz Café proprietor Mike Tilley told the unruly to shut up or get out. Keith Crombie would have approved! The Monk disciples applauded spontaneously – things were hotting up! Four in One – perhaps the tune of the night – reached new heights. To top the lot Nutty was nothing short of brilliant. The deafening applause, short of a standing ovation, won an encore. Wilson and Edis’ gig is a real contender for Gig of the Year, that’s how good it was.